Coach Steve Swazo enters his 13th season as Head Softball Coach of the Lady Trojan softball team. The last four seasons, his team has averaged more than 30 wins each season and now has 337 wins while coaching at Trinidad State. His 2017-18 team won its second consecutive Region IX Championship and placed its second athlete to move on to a D1 school in Katie Glaze who will play at the University of Northern Colorado in Greeley. The 2017-18 class had nine of its 11 sophomores move on to a 4-year University to continue their softball careers with either an academic or athletic scholarship. Also most important was this class had an overall GPA of 3.55 as a team and (10) student athletes made NJCAA All-American Academic Honors and (14) made Region IX All-Academic Honors. The students excelled not only on the softball field but also in the classroom. His 2016-17 team set new records in many categories including winning the Region IX Conference title and also winning the Region IX Championship. Included in the record setting year, Swazo collected his 300th collegiate win. His 2017 squad finished second in the nation in home runs with 118 and Swazo coached his first NJCAA First Team All-American athlete in Isabella Navarro. Navarro was Region IX Player of the Year her sophomore year and was Freshmen of the Year. She leaves Trinidad State as the all-time leader in hits, runs batted in, home runs and batting average and will continue her softball career at Division I Colorado State University in Fort Collins. So far, a total of 49 former Trinidad State Junior College softball student athletes have played softball and furthered their education at a four-year university. 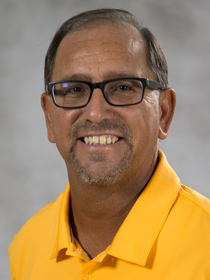 Prior to Trinidad State Junior College, Swazo, a native of Trinidad, was an assistant baseball coach for Trinidad High School as well as the freshmen boys’ basketball coach. He also worked with special needs students. From 1985 through 2005, Swazo coached in Nebraska and has more than 20 years of coaching high school baseball teams. He also assisted in coaching clinics with the University of Nebraska at Lincoln, Oklahoma State University, and Northeastern Oklahoma A & M College and was the women’s JV basketball coach for one year at the University of Nebraska at Kearney. Swazo holds a Bachelors of Science Degree in Physical Education and minor in Special Education from the University of Nebraska at Kearney and also a degree in radio broadcasting. Coach Swazo helps out with many softball camps during the summer months in Utah, California, New Mexico, Nevada and Colorado. Swazo and his Lady Trojans also assisted with the Trinidad Wildcats softball team this past spring.